The loss of a child is every parent's worst fear. Gordon Livingston survived that tragedy not once but twice, in successive years. 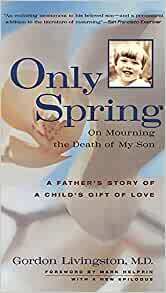 Only Spring, crafted from his journal, traces his son Lucas's courageous battle with leukemia, his extraordinary gift of love, and Livingston's own cycle of faith lost and hope regained. This edition includes a new epilogue by the author. 5.0 out of 5 starsGood advice for the grieving process. 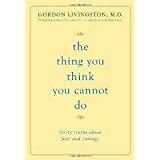 I have read all of Dr. Livingston's books and loved them and this one did not disappoint. He tells it like is with out sugar coating that life will be all right after you lose someone who is your whole world. My husband died 8 years ago and I am still active in life, but the pain of missing him will never go away. Dr. L. gets that. This author is incredibly honest. He tells this very painful story exactly as he sees it. They did everything they could to save their son and in the end it wasn't enough. 5.0 out of 5 starsamazing book written from the perspective of a father who has lost his children (one to suicide and one to leukemia). This book was very well written and very moving. I liked that it was written from the perspective of a father. After reading many grief books I found this to be very different. It's a book I will share with other parents who have lost a child, especially through leukemia. Gordon Livingston writes with clarity and honesty about the illness and death of his beloved youngest son, and the aftermath he and his family endured. The book faithfully captures the roller coaster of emotions that accompany the trajectory of illness, as well as the benumbed unreality of such a shocking loss when death occurs. A beautifully brave account of moving into and through a fog of despair, doubt, and guilt, eventually giving way to a ray of hope and light. Gordon Livingston has instant credibility based on the early deaths of his two sons. Playing a role in doing what a parent thinks is best for a child, relying on doctors opinions, can all be real questions for those with children who might have a potentially terminal disease. Heartbreaking, but fantastic writing. Good book if you have to deal with death of a child or someone you call or fee is a son. They met all of our expectations.